Up to Dingboche 4400m above sea level. A long day of walking a full 8 hours not too many steep inclines and because of this the day I was looking forward to the most. But..... It rained all night. We were warned that the path would be difficult very rocky and uneven and not very wide in parts. Added to that walking through a constant river of mud and the temperature dropping quite considerably as we started walking into the snow zone. I just kept singing Justin Timberlakes song "cry me a river" over and over in my head.As it was a long day of walking we stopped for morning tea about 11.30 and I passed some prayer wheels, spun them saying out loud "please stop the rain, please stop the rain", and immediately snow fell from the roof and covered me. Much to the amusement of John who was behind me. But then like the gods heard me it stopped raining but started snowing. Be careful what you wish for cause you might just get it! Next time I'll be a little more specific and ask for what I want. By lunch time we were all saturated to the bone, feet slooching in our shoes, snow gathered on top our daypacks. Not having ever trekked in snow before I found it very slippery, very difficult to walk. Up to this level we're suppose to still be walking in tee shirts or at most a long sleeve shirt. This snow is very unseasonal and isnt due for another 6 weeks at least. I'm told it hasn't snowed here in October for 16 years! 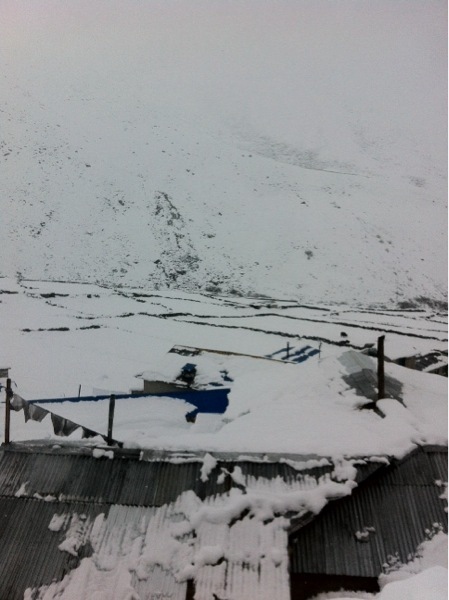 The most snow we're suppose to see was some residual snow near Kalapatar near Everest. I'm not prepared for this and neither is most our group. In our nightly briefing we were told our usual acclimatization walk is all snowed in so it wouldn't be an option tomorrow, and most likely Kalapatar is now out of the question. We would take each day as it came and not make final decisions until the last minute. I did voice my concerns to Bikash that I didn't pack for walking in snow and was concerned about injury. Some of the rocks yesterday were covered in ice and so slippery. Walking in snow, big snow flakes falling all around you, with magnificent mountains all around you. It sound lovely doesn't it? John equalled our trek yesterday to The Lord of the Rings movies. And yes that was a perfect analogy. Five people from different walks of life all enduring hardship battling the ever present yaks that come out of no where-all for a common cause! As well as the scenery being exactly the same in parts, steep rocky stairs that drop down to nothing on one side. Not many photos over the last two days, too wet and just too exhausted and also ran out of battery on my phone for all the lovely iphone moments I've been sending you.